CALGARY – NDP Leader Rachel Notley pledged more flood protection for Calgary on Friday as she and United Conservative rival Jason Kenney accused each other of dithering on another project to help prevent a repeat of the 2013 deluge that heavily damaged parts of the region. Notley said if re-elected on April 16, her government would invest $1 billion over 10 years on flood diversion along the Bow River upstream from the city. She said three potential projects are already being considered, including two new reservoirs and an extension to another. That infrastructure would be in addition to the $432-million Springbank dry dam planned for west of Calgary, but the project has faced delays and opposition from some ranchers. 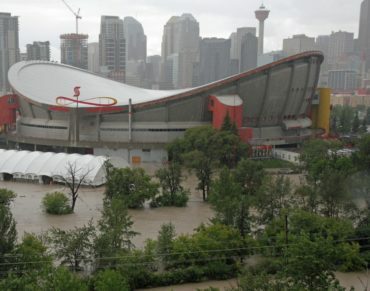 Calgary, Alberta, Canada, – June 21, 2013: Because of heavy rains the Elbow River has overflowed, flooding the Stampede grounds in Calgary, and causing a crisis for many. “We know it is the best, fastest, safest and most cost-effective option for Albertans,” Notley said of Springbank as she stood at a viewpoint overlooking the Bow River and downtown Calgary, much of which was submerged in the June 2013 flood. She accused Kenney of being noncommittal on the Springbank project and suggested UCP candidates have been divided in their support.